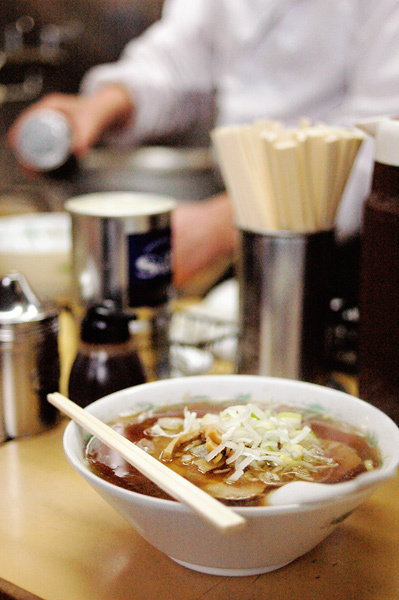 A bowl of ramen in one of its simplest forms; vermicelli-like extra-thin noodles in soy sauce-based broth, topped with a couple of slices of cured pork and a mound of thinly sliced spring onions. I always have mine with generous shakes of ground black pepper, but it's up to you. 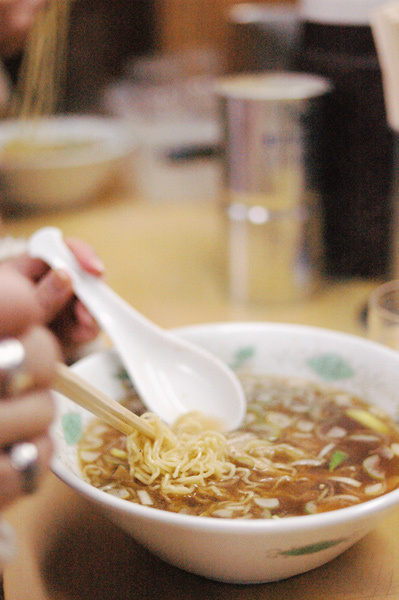 A word or two about ramen; you can eat your ramen in any way you like, but if I were to give you just one advice, it would be this: whatever you do, gobble down your noodles as fast as possible. Or they will soak up the liquid endlessly and expand like crazy, getting too soft to be palatable - and sooner than later you'll find yourself comfronted with a mushy mess of tasteless, soggy noodles that refuse to disappear no matter how hard you try to finish them. So, if you are at a ramen bar with company, don't eat and chat at the same time; eat first, then chat, unless you want to ruin your meal. Or, unless you are skilled at juggling eating and chatting (without being rude), like I am! Anyways. Welcome back to Japan, J! >> Look back last year's Mission Breakfast at Tsukiji here. hi teresa - too bad you guys missed it when you were last here. it's not that they don't like tourists in general, it's some of those who were bad-behaved that troubled them. As long as you are looking out carefully and try not to get in the way of folks busy at work inside the innner market, you'll be ok. besides, the 'outer market (jogai)' area has always been open to locals and tourists and the likes, and it's worth just hanging around there, without ever even going into the 'inner market (jonai)', where the auction takes place. next time! Looks yummy, thanks for the tip! I just came across your blog and I would love a link to it from our site, Foodista.com. You can create inbound links from our site using these Blogger tools. Also please feel free to share any recipes and tips with us. Thanks! Thank you for your beautiful eating and cooking experiences. I have heard about your blog through Clea Cuisine. to illustrate types of breakfast in Tsukiji market (you will see that there is already one!). Julie - thanks for considering including my pictures as part of your project. i'd be honored to have them appear on your site so long as they are credited. let me know if/when you've done a post so i can come and check it out. thanks!